It's a Par - tay! Label Tulip is going to be TWO and you are invited to help us celebrate! Stay tuned! I love this time of year because between the long days and abundance of fun summer activities, there are just so many things to do and memories to make. This also means plenty of opportunities to take photos! Now, personally I think one of the best ways to showcase a whole bunch of photos that span a longer period of time (like say, Summer) or that have a common theme (Summer!) 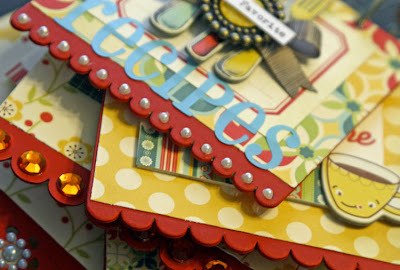 is to make a mini-book. - make you really feel like you have accomplished something when you get it done. 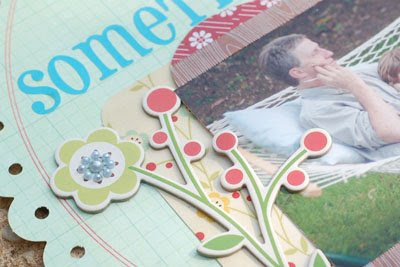 Once you have supplies, just grab some of your favorite photos, stamps and tools and get ready to play. 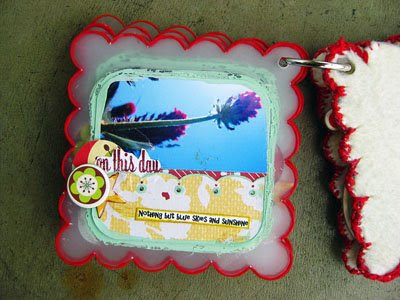 Here is a little mini I made using our June kit Sugar Shoppe. So what did you notice about the book? Hopefully you noticed that even though the photos really didn't look like they were all that related, it still looked like it all went together. For the story I wanted to tell, these photos are important, but really aren't all that "matchy." But there is an easy way to get around that little problem. Here is the most valuable piece of information I ever learned about how to quickly and easily make mini-books: Use a formula. That's it. Decide on a formula or design pattern and repeat, repeat, repeat. 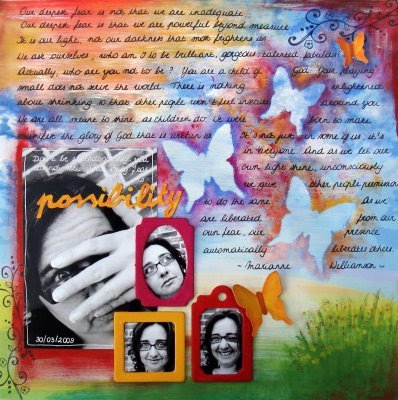 - inked journaling strips on bottom. 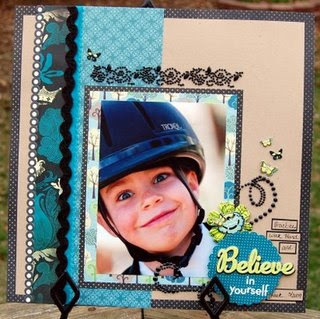 A lot of minis use the photo on one side, journaling on opposite side formula. You could also pick a favorite page sketch and use it over and over. Or use the same stamp over and over. It's not boring. It's a mini, it's supposed to look like it goes together! Now, that's not to say that all minis should look this way, I'm just offering it as a suggestion to get you started. Let your creativity take you where you want to go. Go crazy and customize if you want to. For example, with this mini, I customized my covers by covering them with a cream colored felt and then sewed up the edges with red embroidery thread. 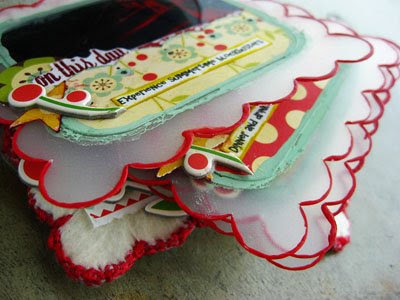 I painted the sheer scalloped edges of the other pages a matching red shade of paint, again to tie it all together. 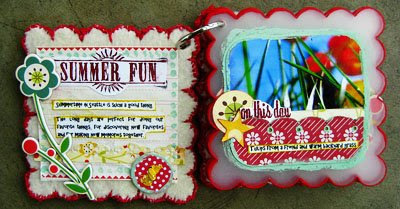 I hope this inspires you to go and try to make your own fun little sumer book. Sugar Shoppe, Rock Candy and Saltwater Taffy! Can't you just picture Shirley Temple dancing around the Label Tulip forums singing Good ship Lollipop! I'm telling you June's kit just makes me think of all my favorite things in life! 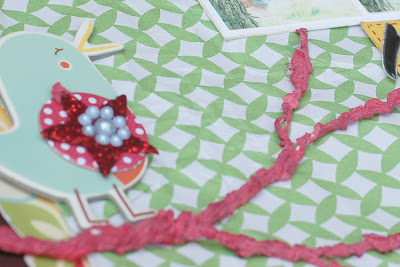 So, in case you somehow missed it, be sure to give your heart a little smile by checking out the super sweet June kits here and the always inspiring Tulip Girl Gallery this month! Also, if you want a chance to win a kit, check out the fun at the Cosmo Cricket blog! AND, now, I shall share a few of my very faves from this month's gallery! 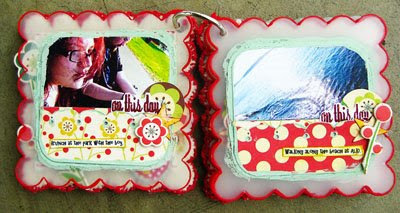 The yummy layering, that sweet sentiment... what's not to love? 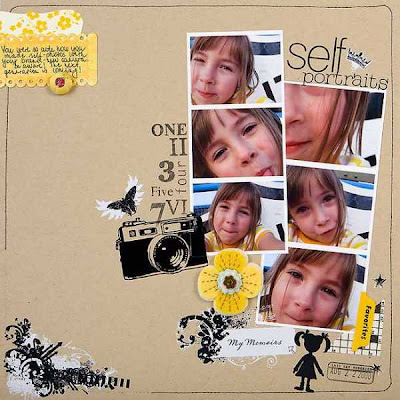 Shoot for the Stars page- I adore that photo, design and whimiscal feel! 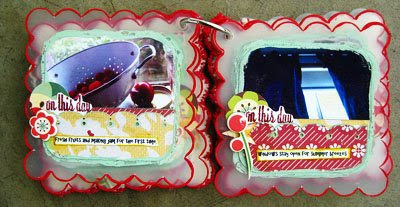 I love the photo, journaling, layers and the border punch she used! beautiful! Dani's sing makes my heart sing. 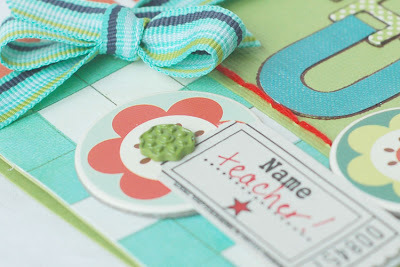 with the sweet title and the little notes flowing across the page! 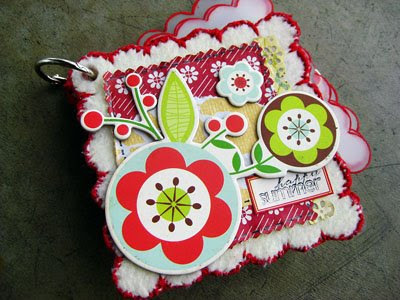 Julie's tussy mussy is so cool and shows just how flexible this kit can be and how creative Julie can be! Kimberly, I so heart her mastering the drop in page. 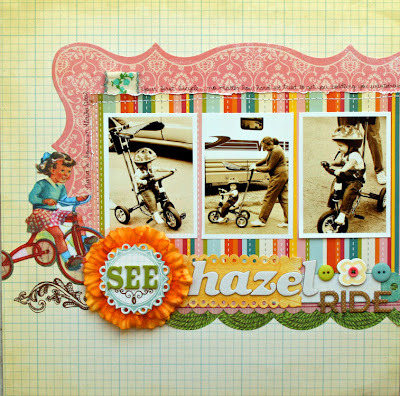 Who says you can't do a masculine page with these kits? Kim nailed it with this one! Leslie's stick together. can't resist the texture, paint and big circles! I've been having so much fun with this month's kit! Here are a few more sneak peeks. This project uses the Main kit. 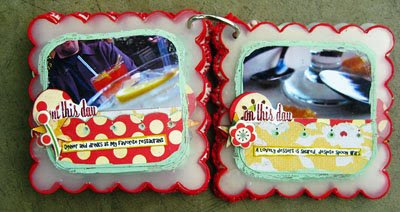 These projects use the Add on kit-Rock Candy, along with the Main kit. You're definitely going to love the goodies this month! Congratulations, Mimi! Your page is absolutely gorgeous in every way! 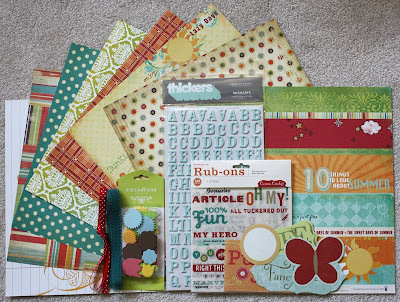 Please send an e-mail with your mailing address to info@labeltulip.com with "Blog Winner" in the subject line. We'll get your prize out to you right away! You have until 11:59 pm this Saturday to link me up here in the comments with your beautiful, favorite creations. On Sunday, I will randomly select one participant to receive the RAK pictured above. 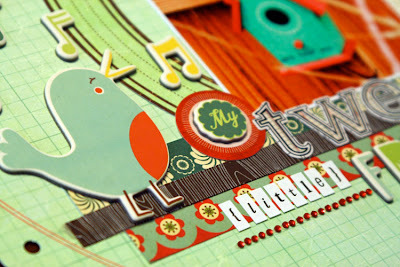 In the meantime, I will leave you with my favorite page that I created lately (with March's LT kit, no less). Be sure to check back here on Sunday for the Rak winner... and some sweet sneaks of June's kit from me as well! 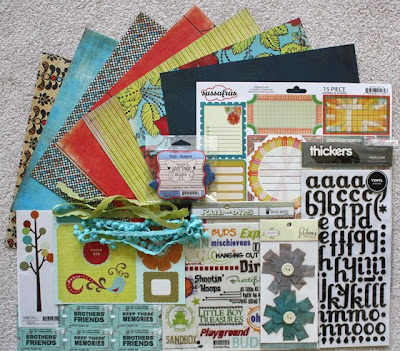 So, have you started your challenge layout yet? Have you SEEN the prize for the challenge? Scrap something that nobody knows about you. It doesn't have to be some earth-shattering secret. a page about how you still collect Beanie Babies. Don't worry, your secret is safe with us! ....isn't that a FUN challenge? It's a great way to get to know someone better. Have I shown you the amazing prize yet?